Our 2011 Emerging Writer Fellows have been working at The Center for Fiction for a year and we wanted to celebrate their hard work and many accomplishments. The evening featured readings by all eight of our writers: Ted Bajek, Marie-Helene Bertino, Mitchell Jackson, Caleb Leisure, Geneviève Mathis, Elizabeth Shah-Hosseini, Mecca Jamilah Sullivan and James Yeh. 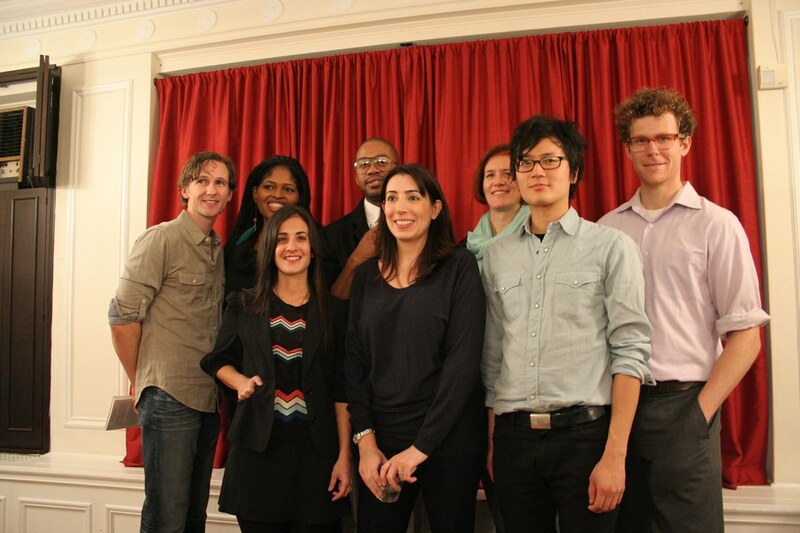 And we're pleased to announce that our new 2012 Emerging Writer Fellows were also introduced at the event. Our 2012 fellows are: Leopoldine Core, Rosalie Knecht, Lisa Lee, Daniel Long, Manuel Martinez, Tracy O'Neill, Tim O'Sullivan, Jackie Reitzes, and Seamus Scanlon. Ted Bajek holds an MFA in fiction from New York University. He lives in Brooklyn. Marie-Helene Bertino's stories have appeared or are forthcoming in The Pushcart Prize Anthology XXXIII, The North American Review (Kurt Vonnegut Award 2007), Mississippi Review, Inkwell, The Indiana Review, American Short Fiction and West Branch. She received an MFA from Brooklyn College, where she was the fiction editor of The Brooklyn Review. She hails from Philadelphia and lives in Brooklyn, where she is the Associate Editor of One Story. Caleb Leisure grew up in Northern California. He recently received an MFA from New York University, where he was twice a Starworks Fellow. He's at work on his first novel. Geneviève Mathis has worked variously as a proposal writer, travel agent, veterinary technician, animal- and human massage therapist, and English tutor before succumbing fully to a life of writing. In 2009 she earned her MFA in Fiction Writing from New York University. She was raised in The Netherlands and the United States, and lives in New York City with her husband and two very mellow cats. Geneviève has just completed her first novel Imago. Elizabeth Shah-Hosseini received an honors degree in comparative literature from Brown University and an M.F.A. in fiction writing from Hunter College. She lives in New York City and is at work on her first novel, The Trespassers. Mecca Jamilah Sullivan is from Harlem, New York. Her fiction has appeared in publications including Callaloo, Best New Writing, Crab Orchard Review, Bloom, The Minnesota Review, 2010 Robert Olen Butler Fiction Prize Stories, Baobab: South African Journal of New Writing, and others. She is the winner of the Charles Johnson Fiction Award, the William Gunn Fiction Award, the James Baldwin Memorial Playwriting Award, and second prize the 2010 American Short Fiction Short Story Contest. She is currently completing her first novel. James Yeh (b. 1982, Anderson, SC) is a writer, editor, and occasional DJ. His work appears or is forthcoming in NOON, McSweeney's, Vice, PEN America, and the anthology 30 Under 30. A recipient of fellowships from The MacDowell Colony and Columbia University, he is a founding editor of Gigantic, a magazine of short prose and art. He is currently at work on a novel titled I Love and Understand You and Would Be Perfect to You Now and lives in Brooklyn.